Self-mutilation in people with posttraumatic stress disorder (PTSD self-mutilation), and in general, is deliberate and direct self-harm, such as cutting or burning, with the intent to injure or destroy body tissues. Self-mutilation (also called self-harm or self-injury) isn't an attempt at suicide, but it does result in injury severe enough to cause tissue damage. Self-harm is usually a reaction to a traumatic experience or set of experiences, with sexual abuse being the most common trigger. One study, for example, found that over 90 percent of people who self-harm on a regular basis had experienced sexual abuse. It is estimated that in the general public, 2% to 6% engage in self-harm at some point in their lives. Among students, the rates are higher, ranging from 13% to 35%. Rates of self-harm are also higher among those in treatment for mental health problems. Those in treatment who have a diagnosis of PTSD are more likely to engage in self-harm than those without PTSD. It appears that deliberate self-harm is a way of expressing and managing negative emotions, such as anxiety, sadness, shame, and/or anger. 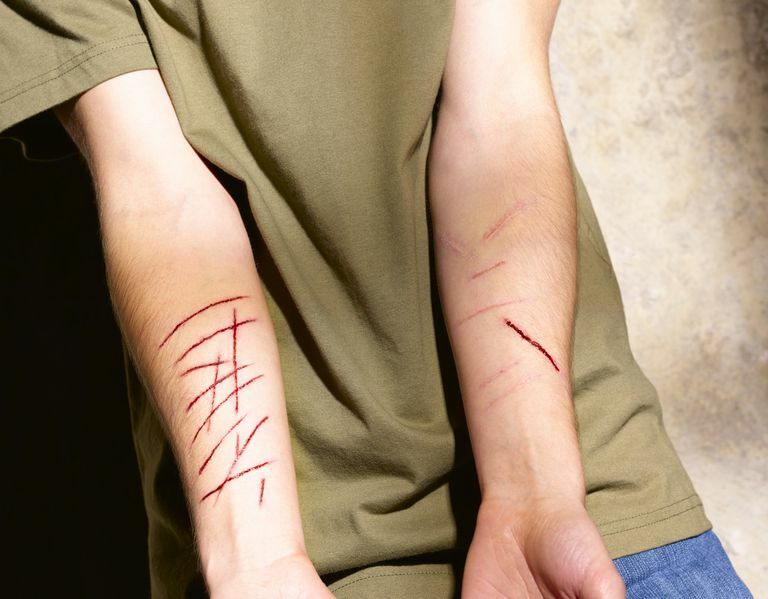 Deliberate self-harm may also provide a temporary escape from emotional pain. However, although it may bring a kind of temporary relief from painful emotions, the emotions may return and intensify afterward. People who have PTSD may use deliberate self-harm as a way of "coming to"—getting back in touch with the present moment (also called "grounding"). In this form of PTSD self-mutilation, when people with PTSD experience dissociation or flashbacks, they may do self-harm, such as cutting or burning, to "shock" their bodies back into the present moment and end the dissociation or flashbacks. What Does PTSD Self-Harm Look Like? Cutting, skin-carving, severe scratching, head-banging, and punching oneself are some of the most common methods of self-injury. Deliberate self-harm is a seriously injurious behavior. The injury itself may be serious, requiring medical care, and untreated injuries may become effective. Unless a self-harming person gets treatment to help stop it, the mutilations may get more severe over time. Of course, self-harm is not a cure for any of the unresolved emotions that cause the behavior; as a result, self-mutilation is unlikely to resolve itself. The most common treatment for self-harming is psychological therapy. Although self-harm is associated with other issues, therapy is most effective when it focuses specifically on self-mutilation. Once the behavior is managed, it is possible to address the underlying trauma and emotional distress that caused it. If you are cutting, burning, or otherwise harming yourself, or if you know someone who is, it's very important to seek help. The S.A.F.E. Alternatives website provides resources and referrals for people struggling with deliberate self-harm. Chapman, A. L., & Dixon-Gordon, K. L. (in press). Emotional Antecedents and Consequences of Deliberate Self-Harm and Suicide Attempts. Suicide & Life-Threatening Behavior. 2007. Gibson, Laura et al. Self-Harm and Trauma: Research Findings. National Center for PTSD. Web. 2016. Whitlock, J., & Knox, K.L... The Relationship Between Self-Injurious Behavior and Suicide in a Young Adult Population. Archives of Pediatrics and Adolescent Medicine, 161, 634-640. 2007.